Chalcedony in foiled silver and gold setting. Christoph Dorsch was the son of a gem engraver from Nuremberg. 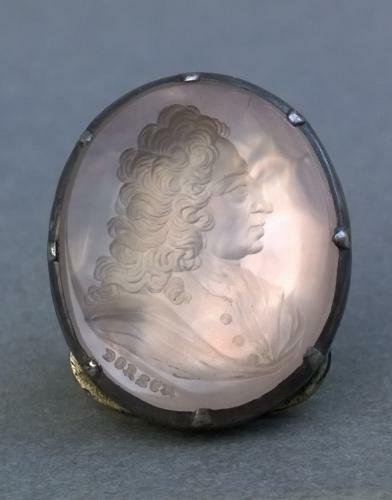 He studied anatomy and drawing at an early age but turned to gem engraving late in life.He carved classical scenes and specialized in portraits, mostly in carnelian and grey chalcedony. The largest collection of his works are in the Leiden Rijksuseum Oudheden, comprising a set of portraits of the Popes of Rome ( 252 subjects) and the Emperors and rulers of Europe (200 subjects). A golden tree, hanging with chalcedony intaglio portraits by Dorsch of the twelve Hapsberg rulers is a highlight of the Kunsthistorisches Museum Vienna. He carved the intaglios for the famous Ebermayer cabinet, portraits of Popes, Kings and emperors, the cabinet was sold to the King of Portugal. Intaglios by Dorsch are rarely signed, this example is a portrait to be viewed face on, the signature is not mirrored as it was not intended to be used to make an impression in wax. The setting which is contemporary with the stone is foiled to reflect the light through the semi translucent stone so that the intaglio appears to be a cameo. The reverse of the setting has a pair of gold loops through which a ribbon would pass enabling the gem to be worn on the wrist. This is an extremely rare item in excellent condition, most of Dorsch's work is now in museum collections.